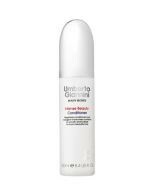 After conditioning hair with Umberto Giannini Intense Beauty Conditioner, a final rinse with cool water will seal the shine. This is not a really heavy conditioner. It is light and leaves my hair silky and soft. the scent is light and gently sweet, lightly floral but certainly not over powering. It is one of the more expensive in the standard conditioners but lasts me ages as you don't ned a lot for each use. "This is not a really heavy conditioner. It is light and leaves my hair silky and soft. the scent is light and gently sweet, lightly..."